For this showcase, we chose 3 gins that were available at Proof. 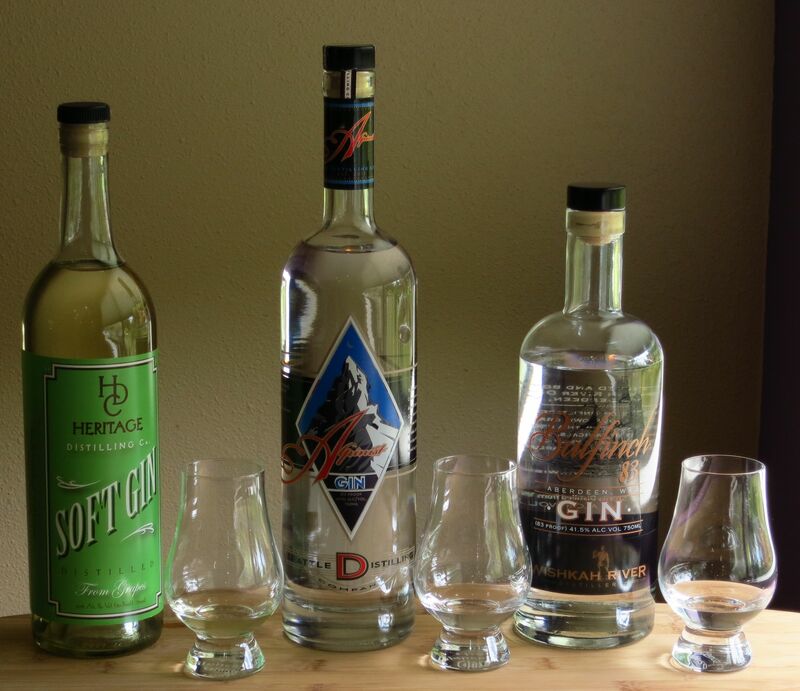 We decided to go with the Soft Gin from Heritage Distilling, the Alpinist from Seattle Distilling and finally the Bulfinch 83 from Wishkah River Distilling. Read on to see what we think. Nose: Elderberry, grape notes, plus a little bit of black pepper and some soft floral notes (like rose). Palate: Very soft mouth feel (go figure :)). Berry, a little bit of juniper, spicy black pepper notes towards the finish. Unusual chocolatey notes mid-palate through the finish. Not a typical gin profile, but really delicious and unique. Nose: Maltiness at first, then a yeasty/citrus/creamy scent like lemon danish, then a little bit of cardamom and cinnamon. Some faint savoriness. Palate: Strong lemon notes. A lot of orange and lemon peel to start, underpinned by juniper and savory pepper notes. Mid-palate, cinnamon pops up and the juniper continues. More cinnamon and a little bit of cardamom towards the end. More of a citrus-y gin. Nose: Grain spirit, undercurrent of earthiness, little bit of lemon, little bit of juniper. Palate: Gentle mouth feel. Citrus to start, little bit of lemon peel and citrus flower, very reserved juniper. Faint sweetness on the mid-palate. Lemon on the mid-palate and finish, plus a little bit of cardamom. Nose: Creamy yeasty smell, lemon danish scent still stands out but with sharper citrus and nice perfume-y notes from the lime. Still some of the malt notes too. Palate: That’s nice! Also well integrated, with the simple syrup nicely balanced with the citrus and the gin. Starts with a really bright sweetness like a lemon hard candy, which is balanced with a little bit of earthiness like orris root and a little bit of astringency from the citrus peel and perfume from the lime. Almost like a collins instead of a rickey. Stir with ice, strain into a glass, garnish with an orange twist. Nose: Orange, Lillet rouge, and a little bit of lemon-herbal citrus (not the orange), almost like coriander. Palate: Sweet with a fairly bitter long finish. Starts bittersweet with a nice mouth feel, think Ricola, followed by a really bright punch of lemon peel and a little bit of anise. Orange peel at the end of the mid-palate. Really strong green vegetal taste on the finish, like jalapeños without the heat. Once again we have 3 very different gins that all do amazing things when you play to their strengths. Hurray for the vibrant distilling scene we are lucky enough to have here in WA! Also, thank you Steven Stone and the Washington Distillers Guild for putting on such an great event, which allowed us to find even more fantastic producers. Update: And now Part 5! This entry was posted in Booze Review, gin, Gin, Showcase, Tasting Notes and tagged 20th century cocktail recipe, gin rickey recipe, heritage distilling soft gin, seattle distilling alpinist gin, Washington gin, wishkah river bulfinch 83 gin. Bookmark the permalink. Nice article but you should have included Pacific Distillery’s Voyager Gin. I have no connection to it but this is a lovely, citrus rich, floral Gin. Great to see these tasting notes on a couple of my favorite gins! It is probably a bit late tho thank you for the nice comment about our Calisaya but … Thank you!! You’re most welcome. Thanks for making such an interesting liqueur!